Pitolisant acts as a high-affinity competitive antagonist (Ki=0.16 nM) and as an inverse agonist (EC50=1.5 nM) at the human histamine H3 receptor subtype. Pitolisant shows high selectivity for H3 receptors compared with the other histamine receptor subtypes (H1, H2, and H4 subtypes) and shows a lack of interaction with other human receptors or channels. In animal experiments, pitolisant increases histaminergic and noradrenergic neuron activity, increases wakefulness at the expense of slow wave and rapid eye movement sleep, has low abuse potential, and has no effect on mechanical or thermal pain thresholds. Calik MW. Nat Sci Sleep. 2017, 9:127-133. Loratadine is a histamine H1 receptor antagonist, used to treat allergies. Also acts as a selective inhibitor of B(0)AT2 with IC50 of 4 μM. 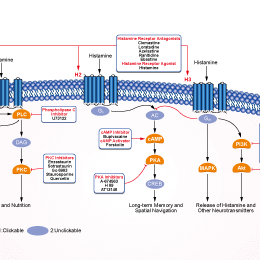 JNJ-7777120 is the first potent and selective non-imidazole histamine H4 receptor antagonist with Ki of 4.5 nM, exhibits >1000-fold selectivity over the other histamin receptors. Azelastine HCl is a potent, second-generation, selective, histamine receptor antagonist, used in the treatment of rhinitis. Clemastine Fumarate (Clemastine) is a selective histamine H1 receptor antagonist with IC50 of 3 nM. Histamine acts directly on the blood vessels to dilate arteries and capillaries mediated by both H 1- and H 2-receptors. Features:Histamine phosphate is indicated as a diagnostic aid for evaluation of gastric acid secretory function. Lidocaine is a selective inverse peripheral histamine H1-receptor agonist with an IC50 of >32 μM. Pemirolast potassium (BMY 26517) is a histamine H1 antagonist and mast cell stabilizer that acts as an antiallergic agent.